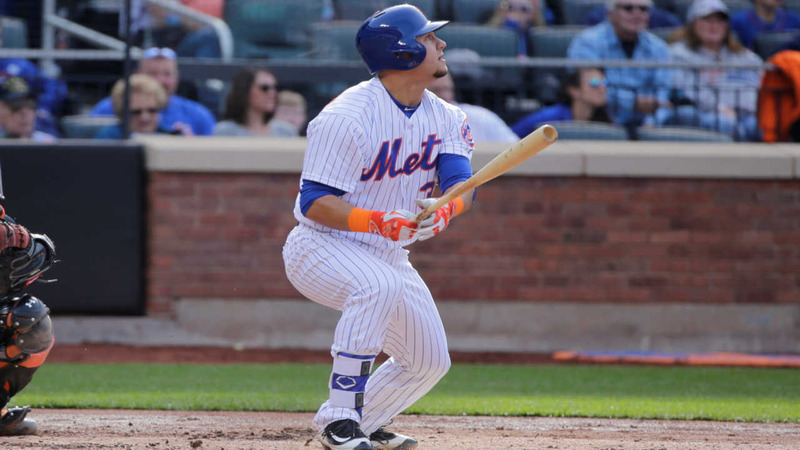 FLUSHING, Queens -- Michael Conforto and Wilmer Flores homered and the New York Mets won their eighth in a row, building an early lead for Jacob deGrom and holding off the San Francisco Giants 6-5 Saturday. The crowd of 44,466 was the largest for a regular-season game at Citi Field since the park opened in 2009, with a lot of fans attracted by the Noah Syndergaard Garden Gnome giveaway. The Mets almost gave away the game, too. Ahead 6-3 in the eighth inning, they walked a pair of batters and let the Giants load the bases with no outs. Hunter Pence's bid for a go-ahead grand slam was caught just in front of the center-field wall for a sacrifice fly. Brandon Crawford followed with another sacrifice fly, a liner that right fielder Curtis Granderson jumped to backhand on the warning track. Jeurys Familia took over in the ninth and closed for his eighth save in as many chances. Conforto tied a Mets record by hitting a double in his sixth straight game. He also singled and drove in three runs. Neil Walker capped a productive first month for his new team with a two-run single. DeGrom (3-0) overcame his first four walks of the season, pitching two-hit ball for six innings. All three runs against him were unearned and came after a throwing error by Flores, who played third base to give David Wright a day off. New York's defense also helped deGrom. Pence fisted a bases-loaded, two-run single with two outs in the third, but first baseman Lucas Duda took the accurate relay from Granderson and threw out Brandon Belt trying to reach third. A day after the Mets set a club mark by scoring 12 runs in the third inning, they quickly struck against Matt Cain (0-3). Walker's two-out single in the first made it 2-0. Conforto launched a two-run double off the top of the left-field wall in the second for a 4-0 lead. Overall, the Mets have outscored opponents 50-21 during their winning string. Cain has gone a career-worst 12 starts without a win, dating to his last victory July 22. Slowed by injuries and inconsistency in recent years, the three-time All-Star who once pitched a perfect game is saddled with a 7.00 ERA this season. Conforto hit his fourth homer in the fifth. Flores connected the next inning for his first of the year. The Mets have 31 home runs in their last 14 games. The Giants had won five straight series at Citi Field before losing the first two games of this set. Giants: 2B Joe Panik was out of the lineup a day after tweaking his groin. Mets: Wright and C Kevin Plawecki got to sit for a day. C Rene Rivera, who started 87 games for the Rays last year, made his Mets debut. He was hit by a pitch in the back his first time up. A prime pitching matchup on deck - if the weather holds. Steady rain is in the forecast Sunday and well could dampen the duel between Giants ace Madison Bumgarner (2-2, 3.64 ERA) and Syndergaard (2-0, 1.69). Bumgarner has won all three of his starts at Citi Field with an 0.78 ERA. Syndergaard has struck out 38 this season, matching Pedro Martinez for the most by a Mets pitcher in the first four starts of a season.